The beta version of the Google app for Android has a new update rolling out that brings a handy screenshot editing feature – but it only works within the Google app itself. The new feature has arrived in version 7.21 for those keeping score at home and, given it is in beta, it will likely hit the stable channel for everyone over the course of the next couple of weeks. 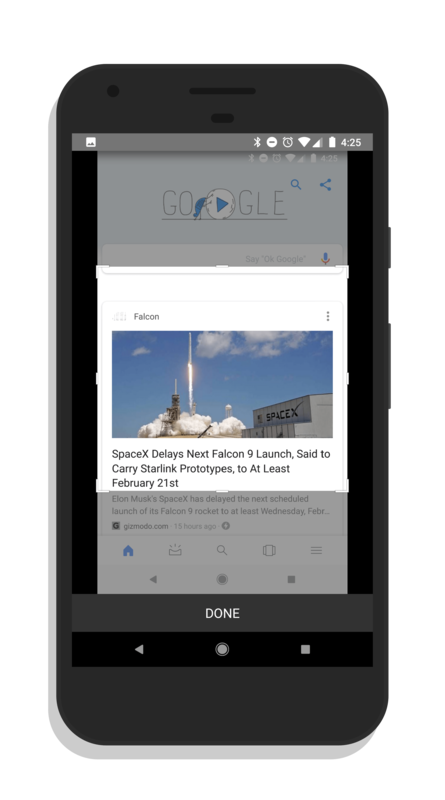 The new screenshot editor allows you to take a screenshot of something in your Google app feed, search results, or pages viewed within Chrome custom tabs in the app. Once you snap the screenshot, by pressing the Power+Volume Down button on virtually all Android phones, you will get a lower notification for you to edit or share the screenshot. The editor allows for simple cropping as well as being able to mark up the screenshot with ink to highlight something within the screenshot. It isn’t aimed at being a full blown photo editor. The new feature, at least in the beta build, is disabled by default. You can enable it by going to Accounts & Privacy in the Settings of the app then enable the screenshot feature at the bottom of the page. If you want to try out the beta build of the Google app now, signing up for it is easy. Just go to the Play Store on your phone, search for the Google app and on the app’s page, scroll all the way down to join the beta. Within a few minutes you’ll get a notification to update to the beta build. Oh, and you can leave any time to go back to the stable channel.